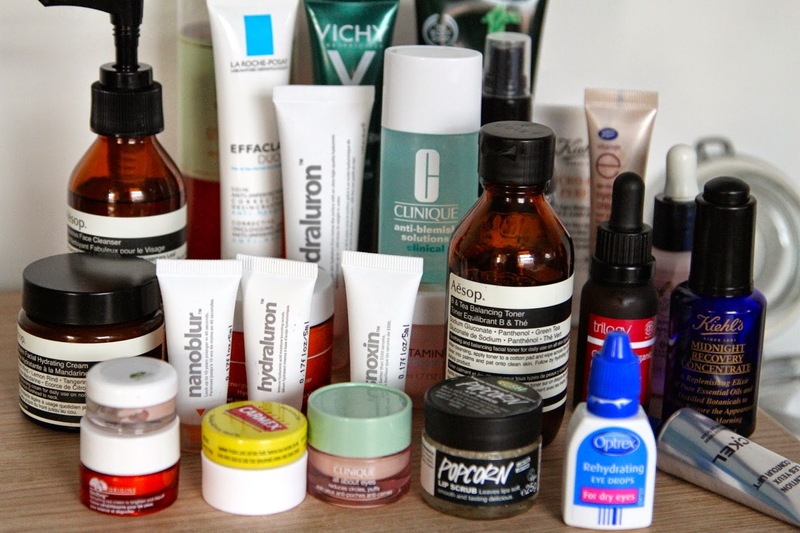 If any of you out there have a skincare obsession like I do, you’ll know that you can never be happy with one product or brand and you always have to keep searching for new exciting products on the market. But there’s nothing wrong with that (in my eyes), I love the thrill of trying out new products and wondering what the effects will be. Could this new product be the one that saves my skin, will it work, won’t it work… the questions go on. And thats where the fun starts. Before I started this blog finding the perfect skincare routine was my goal and I think I’ve just about nailed it, and ill tell you how I did it. As I’ve mentioned in pervious posts everyones skin is different. This is where you need to start, ask yourself, what is your skin type? Dry? Oily? Combination? Normal? Once you’ve decided on this you can start looking for products. No matter what skin type you have if your looking for a full blown skincare routine its the same order for all. I know there are so many different opinions out there but this is the way I’ve done it and its worked for me, I may be wrong with a few steps as I’m no expert but this is just based on personal experience and knowledge I’ve gained. So lets begin! Some of the stages below are optional and can be missed so don’t worry if it looks a little long for you. I like to keep my morning routine simple and light, there is nothing worse than spending the day with a face full of creams and solutions sat on your skin especially in the summer time. Im also not a morning person so the last thing I want to be doing is faffing around. I start off with using a cleanser before my shower, I usually go for a creamy one as it wakes me up leaving my skin feeling fresh and awake. I then take a shower (like you needed to know). Next I move onto my toner and since on a morning I only use one, I tend to go for a hydrating toner such as the Lush Tea Tree Toner. Next I will move onto a light treatment such as the Clinique Anti-Blemish Solution, then move onto an eye cream, finally moisturise and apply a product with SPF in it, either being a sun lotion or moisturiser that includes the protection. And thats the morning routine compete! The evening routine is the one you can take the most time on, so therefore I spend a little longer by adding a few more stages into it. I always double cleanse and double tone on an evening. First I go for a oil or balm based cleanser to remove all the dirt thats built up on my face throughout the day. Then ill go for an exfoliating cleanser such as the Pixi Glow Tonic. Ill then tone my face with a hydrating toner then again with a acid toner such as the Alpha H Liquid Gold. This then starts off the treatment process however I only use acid toners twice a week since they can sometimes be a little harsh on the skin if overused. Next I use a serum and lately I’ve being loving the Kiehls Midnight Recovery Concentrate. It leaves your skin feeling fresh and glowing. Moving on, I go in with an eye cream, Hydraluron, Moisturiser and target treatment. For my target treatment I use the Mario Badescu Drying Lotion, one of the best products I’ve ever came across! Check out my review for it, its unbelievable. These routines always get shuffled about and new products introduced, but that is the general structure I go for. I love to find out new products and introduce new brands into my routine so please let me know what you use and I’ll be more than happy to try it out! Thanks for reading guys and I hope this has helped you with a structure to base your skincare routine on. Previous Post Skincare | Why should you double cleanse?